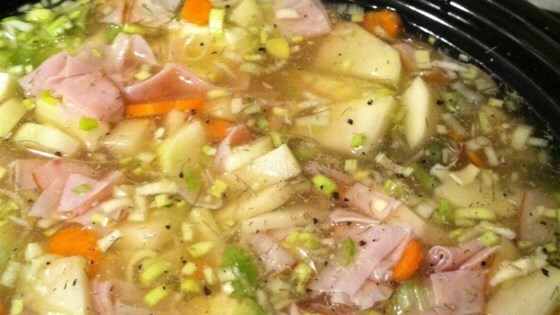 "Easy slow cooker potato soup with ham. Perfect for a wintry day and makes the house smell delicious. Serve with buttered toast and follow with warm apple pie." Combine potatoes, ham, leek, celery, carrots, butter, garlic powder, dill, and bay leaf in a slow cooker; season with salt and pepper. Pour chicken broth over the mixture. Delicious! Even better the second day (as is the way with most soups). I did, however, add a can of cream of celery soup to it to make it look creamier. Excellent recipe. Yum! I made this for a soup supper at church, made a double batch, and came home with enough for one serving. Enough said! This was very good and easy.